Shinji Ohmaki has been actively holding ambitious solo exhibitions since 2000, receiving much attention for his 3 original types of contemporary art installation and exhibition: "ECHO", "Liminar Air" and "Memorial Rebirth". Changing the exhibition space into the extraordinary world, Ohmaki presents dynamic installations and art works that wake visitor's physical senses. International fashion brands Louis Vuitton and Hermès have also invited him for commission works. In 2008, he designed and created a “Bubble Machine” which can produce 10,000 bubbles per minute and developed non-toxic soap bubble for one of his signature artworks “Memorial Rebirth”. The performance has toured over 20 cities in Japan, Taiwan and Australia. It was also the opening performance for the first Setouchi Art Festival in 2010. 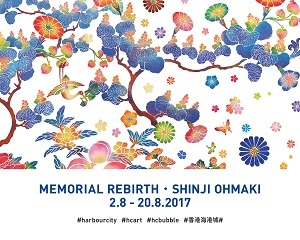 This time, Ohmaki will transport the bubble machines and the soap bubble from Japan to Hong Kong to stage the 20 bubble performance shows at Ocean Terminal Forecourt of Harbour City. He has tailor-designed a 3-meter tall, 6-level Bubble Pyramid at the centre of the forecourt. 45 Bubble Machines will be installed at different levels and directions to produce 10 million bubbles under the backdrop of Victoria Harbour and recall the happy childhood memories of everyone.